Model 32: This extremely compact holster is designed to provide complete and secure cover for the entire weapon, successfully combining total protection with a high level of concealment. With all the regular features of a Horseshoe holster (see enlarged image), it also has tunnel loops for a really minimal profile. A slight muzzle-rear rake and molded sight-track ensure a snag free draw. The rear protective tab comes as standard with this model. Here's my usual word of caution: As with all holsters that are task-specific, there is a price to pay for the degree of weapon protection afforded by this holster. That price is a distinct loss of speed. 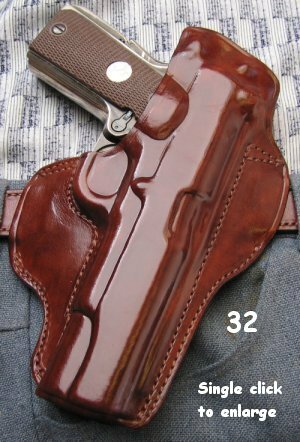 Because of the amount of leather surrounding the pistol, weapon acquisition may suffer, thus making the model 32 considerably slower than most other Horseshoe holsters. Nor would it, in my opinion, be suitable for the Glock, Sigma or Springfield XD range of pistols, or any other pistol in the wide-bodied category. Their extreme width may cause the holster to partially close up on itself when these weapons are drawn, making one-handed re-holstering a bit of a problem. 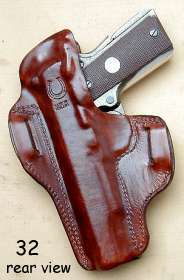 Check the availability of this holster for your weapon by consulting the Holster Selector Chart. Available for belt widths of 1 1/4" or 1 1/2" only in Saddle Tan, Cordovan, or Black (Click here for colour samples). To see an action demonstration of model 32, ensure your browser is Java-enabled, wait until this page has fully loaded ("Document Done" or "Done" in Status Bar) then Click this link.